Abstract: This study contributes a better understanding of the mineralogy and zoning of skarns and related mineralization in three parts of the ASARCO Mission Complex: 1) San Xavier South (SXS), 2) East Mission, and 3) Mission-Pima (PS). In addition, it better characterizes various types of associated Mo mineralization. A combination of field and laboratory work to these ends built on previous work. The SXS, Mission, and PS ore bodies occur within calc-silicate altered (skarn or tactite), calcareous, dolomitic, and siliciclastic upper Paleozoic sedimentary rocks of the Concha Limestone, Scherrer Quartzite, and Epitaph Formation. Hydrothermal features are part of a porphyry Cu(-Mo) system generated by quartz monzonite stocks (QMP) (58-59 Ma). Alteration varies with protolith composition. High grade Mo mineralization generally occurs in two modes: 1) disseminated masses in clinopyroxene-tremolite (± calcite, anhydrite) hornfels, 2) trace amounts in garnet ± clinopyroxene skarn locally closely associated with scheelite, and 3) as fracture-controlled mineralization. Vein paragenesis plays an important role in ore characterization, which varies considerably throughout the deposit. From this study, the relationships between mineral assemblages provide the framework for a broad time-space relationship of zonation. Zoning and mineral composition differ between skarns hosted by relatively pure and impure carbonate lithologies. The Permian Concha Limestone represents an example of a nearly pure carbonate host, whereas the older Permian Epitaph Formation, an interbedded silty carbonate-rich sediment, represents the impure carbonate. Compositions of garnet and pyroxene from mixed Permian-hosted skarn, based on microprobe analyses, indicate 1) considerable ranges in composition between lithologies, 2) differences in composition between ore types, 3) irregular zoning due to oscillations in crystal chemistry between Fe-rich cores to Al-rich rims on zoned garnets from both the Mission and Pima South orebodies, and 4) regular zonation patterns from Fe-rich garnets in areas where higher grade Cu occurs to more aluminous garnets in non-sulfide bearing calc-silicate altered units. Garnet compositions from the garnet-anhydrite-calcite-quartz interbeds of the Epitaph Formation generally range from Adr50 to Adr91 and are more aluminous than garnets formed in the Concha Limestone. Garnet compositions in the Concha Limestone range from Adr90-Adr100 and represent the addition of Fe as well as Cu ± Zn-Pb-Ag-Bi-W through metasomatism. In the Mission and Pima South orebodies, clinopyroxene compositions in the middle member of the Scherrer Formation are generally pure diopside and show little to no compositional zoning in individual grains. Thus, the diopside hornfels of the Mission and Pima South ore bodies, commonly nested between an upper orthoquartzite and lower silty quartzite, likely originated by isochemical metamorphism rather than metasomatism. In contrast, the clinopyroxene crystals from San Xavier South are compositionally zoned. The pure diopside cores represent an earlier alteration event influenced by isochemical metamorphic processes, whereas the rims contain a higher Fe2+ content--a more common composition of clinopyroxene formed by metasomatic processes, which is largely governed by protolith chemistry. Largely, the mineral compositions of garnet and pyroxene crystals of the San Xavier South-Mission-Pima ore bodies represent mineral composition profiles compatible with metasomatism. Bio: Sarah is a southern Californian from Torrance, California who learned to love camping, mineral collecting, prospecting, and geology from her father, Pete Baxter; a former mine engineering student of the Mackey School of Mines. In 1999, she graduated from the University of California, Davis with a degree in Political Science and a minor in US History. It was not until after working in law for five years as a Business Finance and Insolvency paralegal in San Francisco, California and Portland, Oregon that she realized her true calling; life-long career as an Economic Geologist. Sarah graduated from Oregon State University with a Bachelor’s of Science in Geology in 2008. Under the advisement of John H. Dilles, she completed a senior thesis project on an underground mesothermal gold deposit in the Klamath Mountain range entitled: Mineralogy of Gold-Quartz Veins of the French Gulch District, Shasta County, California; funded by department scholarship Sarah was awarded for academic excellent in Geosciences. In 2008, Sarah began her career as a geologist for Freeport McMoRan in Morenci, Arizona. 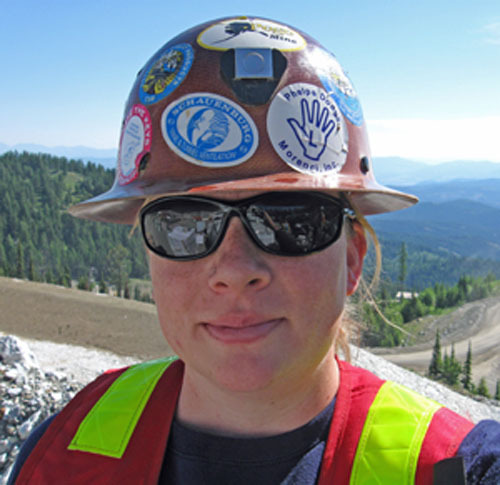 Following work in Alaska for Pathfinder Mineral Services and Sumitomo metal mining in 2009, she formed Klondike Mountain Geological Services and has worked as a contract geologist for Kinross Gold Corporation and ASARCO. In her short career, Sarah has worked as exploration and production geologist in several different types of ore deposits. Her diverse career ranged from a helicopter supported reconnaissance field geologist in the Alaskan Interior to near mine-site exploration and production geologist at both underground and open pit operations in Nevada, Alaska, Washington, and Arizona. Recently, Sarah earned her Professional Science Master’s degree in Economic Geology from the University of Arizona. As a student at the U of A, she was awarded the 2013-2014 SRK Consulting scholarship for academic excellence and was a distinguished speaker in Economic Geology at the 43 annual GeoDaze symposium. Her talk this evening entitled: Calc-Silicate alteration and ore characterization, ASARCO Mission Complex: Implications for the optimization of molybdenum recovery was the subject of her graduate research sponsored by ASARCO.